This article is about the Greek mythological figure. For the play by Euripides, see Medea (play). For other uses, see Medea (disambiguation). Not to be confused with Madea. In Greek mythology, Medea (/mɪˈdiːə/; Greek: Μήδεια, Mēdeia, Georgian: მედეა) is a sorceress who was the daughter of King Aeëtes of Colchis, niece of Circe, granddaughter of the sun god Helios, and later wife to the hero Jason. In Euripides's play Medea, Jason abandons Medea when Creon, king of Corinth, offers his daughter Glauce. The play tells of Medea avenging her husband's betrayal by killing their children. Medea figures in the myth of Jason and the Argonauts, a myth known best from a late literary version worked up by Apollonius of Rhodes in the 3rd century BC and called the Argonautica. 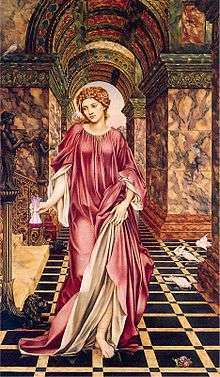 Medea is known in most stories as an enchantress and is often depicted as being a priestess of the goddess Hecate or a witch. The myth of Jason and Medea is very old, originally written around the time Hesiod wrote the Theogony. Medea's role began after Jason came from Iolcus to Colchis, to claim his inheritance and throne by retrieving the Golden Fleece. In the most complete surviving account, the Argonautica of Apollonius, Medea fell in love with him and promised to help him, but only on the condition that if he succeeded, he would take her with him and marry her. Jason agreed. In a familiar mythic motif, Aeëtes promised to give him the fleece, but only if he could perform certain tasks. First, Jason had to plough a field with fire-breathing oxen that he had to yoke himself. Medea gave him an unguent with which to anoint himself and his weapons, to protect him from the bulls' fiery breath. Next, Jason had to sow the teeth of a dragon in the ploughed field (compare the myth of Cadmus). The teeth sprouted into an army of warriors. Jason was forewarned by Medea, however, and knew to throw a rock into the crowd. Unable to determine where the rock had come from, the soldiers attacked and killed each other. Finally, Aeëtes made Jason fight and kill the sleepless dragon that guarded the fleece. Medea put the beast to sleep with her narcotic herbs. Jason then took the fleece and sailed away with Medea, as he had promised. Apollonius says that Medea only helped Jason in the first place because Hera had convinced Aphrodite or Eros to cause Medea to fall in love with him. Medea distracted her father as they fled by killing her brother Absyrtus. In some versions, Medea was said to have dismembered his body and scattered his parts on an island, knowing her father would stop to retrieve them for proper burial; in other versions, it was Absyrtus himself who pursued them, and was killed by Jason. During the fight, Atalanta, a member of the group helping Jason in his quest for the fleece, was seriously wounded, but Medea healed her. 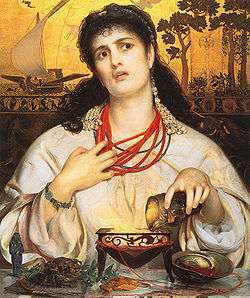 According to some versions, Medea and Jason stopped on her aunt Circe's island so that she could be cleansed after the murder of her brother, relieving her of blame for the deed. On the way back to Thessaly, Medea prophesied that Euphemus, the helmsman of Jason's ship, the Argo, would one day rule over all Libya. This came true through Battus, a descendant of Euphemus. The Argo then reached the island of Crete, guarded by the bronze man, Talos (Talus). Talos had one vein which went from his neck to his ankle, bound shut by a single bronze nail. According to Apollodorus, Talos was slain either when Medea drove him mad with drugs, deceived him that she would make him immortal by removing the nail, or was killed by Poeas's arrow (Apollodorus 1.140). In the Argonautica, Medea hypnotized him from the Argo, driving him mad so that he dislodged the nail, ichor flowed from the wound, and he bled to death (Argonautica 4.1638). After Talos died, the Argo landed. Jason, celebrating his return with the Golden Fleece, noted that his father Aeson was too aged and infirm to participate in the celebrations. Medea withdrew the blood from Aeson's body; she infused it with certain herbs and returned it to his veins, invigorating him. The daughters of king Pelias saw this and wanted the same service for their father. While Jason searched for the Golden Fleece, Hera, who was still angry at Pelias, conspired to make Jason fall in love with Medea, whom Hera hoped would kill Pelias. When Jason and Medea returned to Iolcus, Pelias still refused to give up his throne, so Medea conspired to have Pelias' own daughters kill him. She told them she could turn an old ram into a young ram by cutting up the old ram and boiling it in magic herbs. During her demonstration, a live, young ram jumped out of the pot. Excited, the girls cut their father into pieces and threw him into a pot. Having killed Pelias, Jason and Medea fled to Corinth. With Jason she had five sons, Alcimenes, Thessalus, Tisander, Mermeros and Pheres and a daughter, Eriopis. They were married happily for ten years in Corinth. In Corinth, Jason abandoned Medea for the king's daughter, Glauce. Medea took her revenge by sending Glauce a dress and golden coronet, covered in poison. This resulted in the deaths of both the princess and the king, Creon, when he went to save her. It is said that two of her sons, Mermeros and Pheres, helped their mother's revenge and were murdered by Corinthians for their crime. According to the tragic poet Euripides, Medea continued her revenge, murdering two of her children, Tisander and Alcimenes, herself. Only one son, Thessalus, survived. Afterward, she left Corinth and flew to Athens in a golden chariot driven by dragons sent by her grandfather Helios, god of the sun. Before the fifth century BC, there seem to have been two variants of the myth's conclusion. According to the poet Eumelus to whom the fragmentary epic Korinthiaka is usually attributed, Medea killed her children by accident. The poet Creophylus, however, blamed their murders on the citizens of Corinth. Medea's deliberate murder of her children, then, appears to be Euripides' invention although some scholars believe Neophron created this alternate tradition. Her filicide would go on to become the standard for later writers. Pausanias, writing in the late 2nd century AD, records five different versions of what happened to Medea's children after reporting that he has seen a monument for them while traveling in Corinth. Fleeing from Jason, Medea made her way to Thebes where she healed Heracles (the former Argonaut) from the curse of Hera (that led to the murder of Iphitus, his best friend). In return, Heracles gave her a place to stay in Thebes until the Thebans drove her out in anger, despite Heracles' protests. She then fled to Athens where she met and married Aegeus. They had one son, Medus, although Hesiod makes Medus the son of Jason. Her domestic bliss was once again shattered by the arrival of Aegeus' long-lost son, Theseus. Determined to preserve her own son's inheritance, Medea convinced her husband that Theseus was a threat and that he should be disposed of. 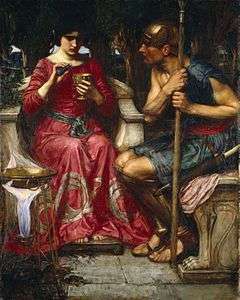 As Medea handed Theseus a cup of poison, Aegeus recognized the young man's sword as his own, which he had left behind many years previously for his newborn son, to be given to him when he came of age. Knocking the cup from Medea's hand, Aegeus embraced Theseus as his own. Medea then returned to Colchis and, finding that Aeëtes had been deposed by his brother Perses, promptly killed her uncle and restored the kingdom to her father. Herodotus reports another version, in which Medea and her son Medus fled from Athens on her flying chariot, to the Iranian plateau and lived among the Aryans, who then changed their name to the Medes. Recounting the many variations of Medea's story, the 1st century BC historian Diodorus Siculus wrote, "Speaking generally, it is because of the desire of the tragic poets for the marvelous that so varied and inconsistent an account of Medea has been given out." There have been many different accounts of Medea’s family tree. One of the only uncontested facts is that she is a direct descendant of the sun god Helios through her father King Aeëtes of Colchis. Helios and his wife Perse (or Perses) had four children: Aeëtes, Circe, Pasiphae, and Perses. Aeëtes then married Idyia (or Iduia) and Medea was one of their children. This is where scholars have begun to question the rest of Medea’s genealogy. By some accounts, Aeëtes and Idyia only had two daughters, Medea and Chalciope (or Chalkiope) and Apsyrtus (or Apsyrtos) was the son of Aeëtes through Asterodea. According to others, Idyia gave birth to Medea and Apsyrtus and Asterodea gave birth to Chalciope. Medea then marries Jason, although the number and names of their children are contested by different scholars. Euripides mentions two unnamed sons (whom Medea kills), others have suggested three sons (Thessalus, Alcimenes, and Tisander) two sons (Mermerus and Pheres) or a son and a daughter (Medeius and Eriopis). After Medea leaves Jason in Corinth, she marries the king of Athens (Aegeus) and bears him a son. Scholars have questioned whether her son Medeius is the son of Jason or of Aegeus, but Medeius goes on to become the ancestor of the Medes by conquering their lands. The importance of Medea’s genealogy is to help define what level of divinity she possessed. By some accounts, like the Argonautica, she is depicted as a young, mortal woman. She is directly influenced by the Greek gods (through Hera and Aphrodite) and while she possess magical abilities, she is still a mortal with divine ancestry. Other accounts, like Euripides’ play Medea, she focuses on her mortality, although she transcends the mortal world at the end of the play with the help of her grandfather Helios and his sun chariot. Hesiod’s Theogony places her marriage to Jason on the list of marriages between mortals and divine, suggesting that she is predominantly divine. She also has connections with the Hecate, who was the goddess of magic, which could be one of the main sources of which she draws her magical ties. The different depiction of Medea’s character clash in ancient literary works. Scholars have examined these accounts of Medea’s story in search for images and themes that tie these versions of Medea together. In Euripides’ play Medea she is a woman scorned, rejected by her husband Jason and seeking revenge. Deborah Boedeker writes about different images and symbolism used in Euripides’ play to invoke responses from his original Athenian audience. The Nurse gives descriptions of Medea in the prologue, highlighting comparisons to great forces of nature and different animals. There is also many nautical references throughout the play either used by other characters when describing Medea or by Medea herself. By including these references, Boedeker argues that these comparisons were used to create connections to the type of woman Medea was. She holds great power (referred to by the comparisons to forces of nature), she relies on her basic animal-like instincts and emotions (connections to different animals like bulls and lions), and it draws the audience back her original myth of Jason’s quest for the Golden Fleece and the sea voyage taken by Jason, Medea, and the Argonauts. Emma Griffiths also adds to the analysis of Medea’s character in Euripides’s play by discussing the male/female dichotomy created by Euripides. Medea does not fit into the mold of a “normal woman” according to Athenian philosophy. She is depicted of having great intelligence and skill, something typically viewed as a masculine trait by Euripides’ original audience. On the other hand, she uses that cunning in order to manipulate the men around her, and manipulation of other people would have been a negative female trait to the Athenian audience. There is also the paradox of how she chooses to murder her victims in the play. She poisons the princess, which would have been seen as a feminine way of murder, yet kills her children in cold blood, which is seen as more masculine. She also has dialogue about her children and shows a strong maternal love and connection to them, something that was essential to “normal women” in Athenian society. Yet at the end of the play she is able to kill her children as part of her revenge. It is through these opposites that Euripides creates a complicated character for his protagonist. Although not the first depiction of Medea, the Argonautica by Apollonios Rhodios gives a fuller description of events that lead up to Euripides’s play, mainly surrounding Jason’s quest for the Golden Fleece. In this literary work, Medea is presented not as a powerful woman seeking justice rather she is a young woman who is desperately in love with Jason. So much in love that she decides to defy her father and kill her brother in order to help him. James J. Clauss writes about this version of Medea, attempting to unearth another version of this character for scholarship and discussion. He looks into different passages in the original text to define the meaning and draw connection to the different feelings Medea was going through. He argues the feelings of Medea’s initial love for Jason, the shame she feels for loving him and for going against her family, and final agreement to help Jason in his quest. Multiple scholars have discussed Medea’s use as a “helper maiden” to Jason’s quest. A helper maid is typically personified as a young woman who helps on a hero’s quest usually out of love. Instead of being the center of the story like she is in Euripides’ Medea, this version of Medea is reduced to a supporting role. Her main purpose is to help the hero with his quest. Jason would never have been successful on his quest without Medea’s help, something that is pointed out and referenced many times in ancient texts and contemporary scholarly work. Other, non-literary traditions guided the vase-painters, and a localized, chthonic presence of Medea was propitiated with unrecorded emotional overtones at Corinth, at the sanctuary devoted to her slain children, or locally venerated elsewhere as a foundress of cities. The dramatic episodes in which Medea plays a role have ensured that she remains vividly represented in popular culture. Cicero - in the court case Pro Caelio, the name Medea is mentioned at least five times, as a way to make fun of Clodia, sister of P. Clodius Pulcher, the man who exiled Cicero. Cicero, Pro Caelio (political speech) Cicero refers to Clodia as hanc Palatinam Medeam, "this Medea of the Palatine"
Rick Riordan, The Lost Hero; Medea, having been resurrected by vengeful goddess Gaea (Mother Earth), runs a department store in Chicago. Morgan St. Knight, Curse of Prometheus: a tale of Medea Medea dwells in modern-day Atlanta, and must fight one of the Olympian gods who has revived a deadly cult. Kerry Greenwood, Medea: Book III in the Delphic Women Series (1997) a retelling of the Jason and the Argonauts epic, focusing on the Princess and Priestess, Medea of Colchis. Dea Loher, Manhattan Medea (1999) in German; play set in modern-day Manhattan; Medea and Jason are living as illegal immigrants, until Jason marries the daughter of a rich businessman, abandoning Medea and their child; the play takes place on their wedding night. Jan Siegel, "The Dragon Charmer" (2000) A side note in an epic trilogy about witchcraft, sorcery & magic. Louis-Nicholas Clerambault composed a cantata for soprano, violin and continuo, called Médée, and was first published in 1710. In George Frideric Handel's opera Teseo [Theseus], 1713, the central character is Medea. Georg Anton Benda composed the melodrama Medea in 1775 on a text by Friedrich Wilhelm Gotter. Luigi Cherubini composed the opera Médée in 1797 and it is Cherubini's best-known work, but better known by its Italian title, Medea. A lost aria, which Cherubini apparently smudged out in spite more than 200 years ago, was revealed by x-ray scans. Simon Mayr composed his opera Medea in Corinto to a libretto of Giuseppe Felice Romano. It premiered in Naples in 1813. Saverio Mercadante composed his opera Medea in 1851 to a libretto by Salvadore Cammarano. Darius Milhaud composed the opera Médée in 1939 to a text by Madeleine Milhaud (his wife and cousin). American composer Samuel Barber wrote his Medea ballet (later renamed The Cave of the Heart) in 1947 for Martha Graham and derived from that Medea's Meditation & Dance of Vengeance Op. 23a in 1955. The musical Blast! uses an arrangement of Barber's Medea as their end to Act I.
Ray E. Luke's "Medea" won the 1979 Rockefeller Foundation/New England Conservatory Competition for Best New American Opera. Jacob Druckman's 1980 orchestral work, Prism, is based on three different renderings of the Medea myth by Charpentier, Cavalli, and Cherubini. Each movement incorporates material and quotations from the music of Druckman's three predecessors. At the time of his death, Druckman was writing a large-scale grand opera on the Medea myth commissioned by the Metropolitan Opera. Star of Indiana—the drum and bugle corps that Blast! formed out of—used Parados, Kantikos Agonias, and Dance of Vengeance in their 1993 production (with Bartók's Allegro from Music for Strings, Percussion and Celeste), between Kantikos and Vengeance. Michael John LaChiusa scored "Marie Christine", a Broadway musical with heavy opera influence based on the story of Medea. The production premiered at the Vivian Beaumont Theater in December 1999 for a limited run under Lincoln Center Theater. LaChuisa's score and book were nominated for a Tony Award in 2000, as was a tour-de-force performance by six-time Tony winner Audra McDonald. Oscar Strasnoy's opera "Midea (2)", based on Irina Possamai's libretto, premiered in 2000 at Teatro Caio Melisso, Spoleto, Italy. Orpheus Opera Award. Vienna Teng, with the song My Medea on her 2004 album Warm Strangers. The Finnish melodic death metal band Insomnium has a song about her called Medeia on their album In the Halls of Awaiting, which was released in 2002. Greek Epic Metal band Battleroar has a song named "The Curse of Medea" in their 2014 album Blood of Legends. Mauro Lanza composed the music to Le Songe De Médée, a ballet choreographed by Angelin Prelijocaj for the Ballet de l'Opéra national de Paris and featured in the film La Danse. Aribert Reimann's opera "Medea" premiered in 2011 at the Vienna State Opera directed by Marco Arturo Marelli with Marlis Petersen in the title role. The southern metal band The Showdown has a song called Medea - One Foot In Hell on their album Back Breaker, which was released in 2008. In 2014, Dutch symphonic/progressive metal band Ex Libris released their second album Medea. It is a concept album which tells the tragic story of Medea. In the 1963 film Jason and the Argonauts, Medea was portrayed by Nancy Kovack. Here she is a Temple Dancer who Jason saves after her ship sinks, causing her to help him. In 1969, the Italian director Pier Paolo Pasolini directed a film adaptation of Medea featuring the opera singer Maria Callas in the title role. In 1978, the film A Dream of Passion in which Melina Mercouri as an actress portraying Medea seeks out Ellen Burstyn, a mother who recently murdered her children. In 1988, director Lars von Trier filmed his Medea for Danish television, using a pre-existing script by filmmaker Carl Theodor Dreyer. Cast included Udo Kier, Kirsten Olesen, Henning Jensen, and Mette Munk Plum. In the 1992 film Highway to Hell, Medea was portrayed by Anne Meara. In the 2000 Hallmark presentation Jason and the Argonauts, Medea was portrayed by Jolene Blalock. In the 2002 biopic of Mexican artist Frida Kahlo, Frida, Diego Rivera's previous wife Lupe Marín (played by Valeria Golino) and Frida Kahlo (played by Salma Hayek) talk of Lupe's response to Diego's infidelity. In response, Frida points a knife in a non-threatening gesture at Lupe, and calls her "Medea". In the 2005 film L'enfer (Hell) a student Anne (Marie Gillain) takes a formal oral exam on the subject of Medea. Her words are spoken over images of her sister Sophie (Emmanuelle Béart) playing with her two children implying an analogy. In the 2004 visual novel as well as the anime adaptations of Fate/Stay Night, Medea appears as a relatively major character under the title of Caster. In 2005, director Theo van Gogh created 6-part miniseries, moving Medea to Dutch politics. In 2007, director Tonino De Bernardi filmed a modern version of the myth, set in Paris and starring Isabelle Huppert as Medea, called Médée Miracle. The character of Medea lives in Paris with Jason, who leaves her. In 2009, Medea was shot by director Natalia Kuznetsova. Film was created by the tragedy of Seneca in a new-for-cinema genre of Rhythmodrama, in which the main basis of acting and atmosphere is music written before shooting. In the 2013 television series Atlantis, Medea is portrayed by Scottish actress Amy Manson. In the 2015 television series Olympus, Medea is portrayed by actress Sonita Henry. In 2016, Olivia Sutherland plays Medea in the MacMillan Films staging of Euripides classic. Between June and August 2016 the Cuban Broadcasting Radio Progreso presented the 60 chapters series The mark of Medea written by Orelvis Linares and directed by Alfredo Fuentes. In the series two women, played by the actresses Arlety Roquefuentes and Rita Bedias, commits crimes inspired by the myth of Medea. This first of them castrates his lover in revenge by his treason. The second one drowns her own four year daughter in a pond because the baby disturbed her plans of living with her lover. Liquid Entertainment's 2008 video game Rise of the Argonauts portrays Medea as a dark sorceress and a defector from a cult of Hecate-worshiping assassins. ↑ William Godwin (1876). "Lives of the Necromancers". p. 41. ↑ Godwin 1876, p. 42. ↑ As noted in a scholium to Pindar's Olympian Ode 13.74; cf. Pausanias 2.3.10-11. ↑ As noted in the scholium to Medea 264. ↑ See McDermott 1985, 10-15. ↑ Hyginus Fabulae 25; Ovid Met. 7.391ff. ; Seneca Medea; Bibliotheca 1.9.28 favors Euripides' version of events, but also records the variant that the Corinthians killed Medea's children in retaliation for her crimes. 1 2 Griffiths, Emma (2006). Medea. London: New York: Routledge. ↑ Boedeker, Deborah (1997). Medea: Essays on Medea in Myth, Literature, Philosophy, and Art. Princeton, NJ. : Princeton University Press. pp. 127–148. ↑ Clauss, James J. (1997). Medea: Essays on Medea in Myth, Literature, Philosophy, and Art. Princeton, NJ. : Princeton University Press. pp. 149–177. ↑ As on the bell krater at the Cleveland Museum of Art (91.1) discussed in detail by Christiane Sourvinou-Inwood, "Medea at a Shifting Distance: Images and Euripidean tragedy", in Clauss and Johnston 1997, pp 253-96. ↑ "Pindar shows her prophesying the foundation of Cyrene; Herodotus makes her the legendary eponymous founder of the Medes; Callimachus and Apollonius describe colonies founded by Colchians originally sent out in pursuit of her" observes Nita Krevans, "Medea as foundation heroine", in Clauss and Johnston 1997 pp 71-82 (p. 71). ↑ Ovid also wrote a full play called Medea from which only a few lines are preserved. ↑ "Film Fest Journal: L'Enfer, 2005". filmref.com. Retrieved 5 August 2015. Wikimedia Commons has media related to Medea. Apollodorus, Apollodorus, The Library, with an English Translation by Sir James George Frazer, F.B.A., F.R.S. in 2 Volumes. Cambridge, MA, Harvard University Press; London, William Heinemann Ltd. 1921. Clauss, J. J. and S. I. Johnston (eds), Medea: Essays on Medea in Myth, Literature, Philosophy and Art. (Princeton, Princeton University Press, 1997). ISBN 9780691043760. Grant, Michael, and John Hazel. 1973.Who's Who in Classical Mythology. London: Weidenfeld & Nicolson. McDermott, Emily, Euripides' Medea: The Incarnation of Disorder. (University Park, PA, Penn State University Press, 1985). ISBN 9780271006475. Smith, William; Dictionary of Greek and Roman Biography and Mythology. London (1873). "Medeia or Medea"